Russian opposition leader Alexey Navalny was found guilty late Monday of calling repeatedly for unlawful protests and sentenced to 30 days of detention. His sentencing followed a day of nationwide anti-corruption demonstrations, during which nearly 1,400 people were arrested amid scuffles with police and reports of tear gas being used. “I am very pleased that people came out, I am proud that I am a part of this movement in which brave, wonderful people, are not afraid to go out on the streets. Even under the threat of some detentions and so on,” he said. Alexey Navalny speaks after his Monday hearing. His wife, Yulia, reported Navalny, 41, was detained at his Moscow home, before he could join the thousands of protesters who clashed with police in Moscow and St. Petersburg. The opposition leader, who plans to run against Vladimir Putin in next year’s presidential election, had mobilized support on social networks in the hope the rallies would rattle the Kremlin. Nearly 1,400 people were arrested in the two cities on Monday, according to OVD, an independent group monitoring arrests. Of those, 825 people were detained during protests in the capital and 548 were arrested in St. Petersburg, the group said. Earlier in the day, the Russian Ministry of Internal Affairs posted different numbers for the two cities: 150 in Moscow and 500 in St. Petersburg. Police detain a protester In Moscow, Russia, Monday, June 12, 2017. 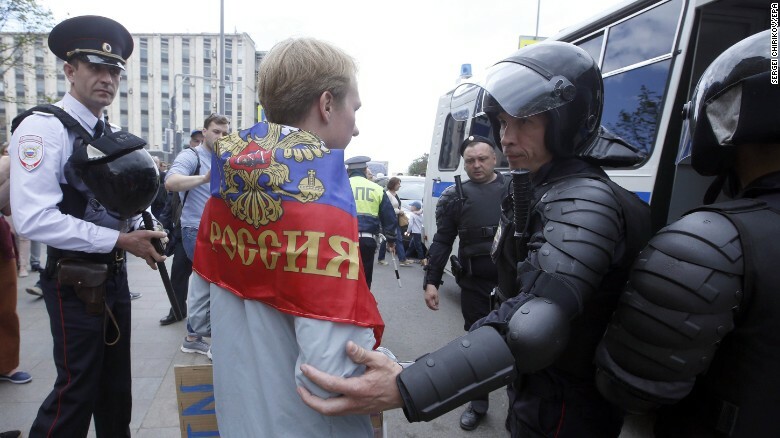 Russian authorities had declared the planned rally in the capital was illegal, and warned those intending to take part that there would be consequences. 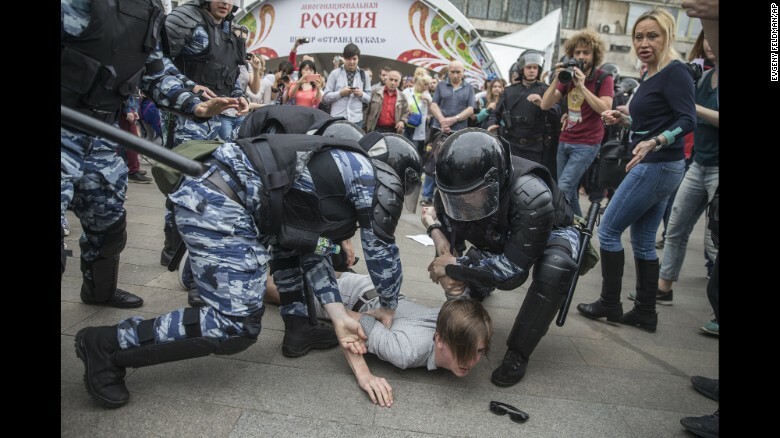 Police detain a participant of an unauthorized rally in Moscow’s Tverskaya Street. Photographs and videos posted on Twitter showed large numbers of police at Tverskaya Street, a main thoroughfare near the Kremlin. 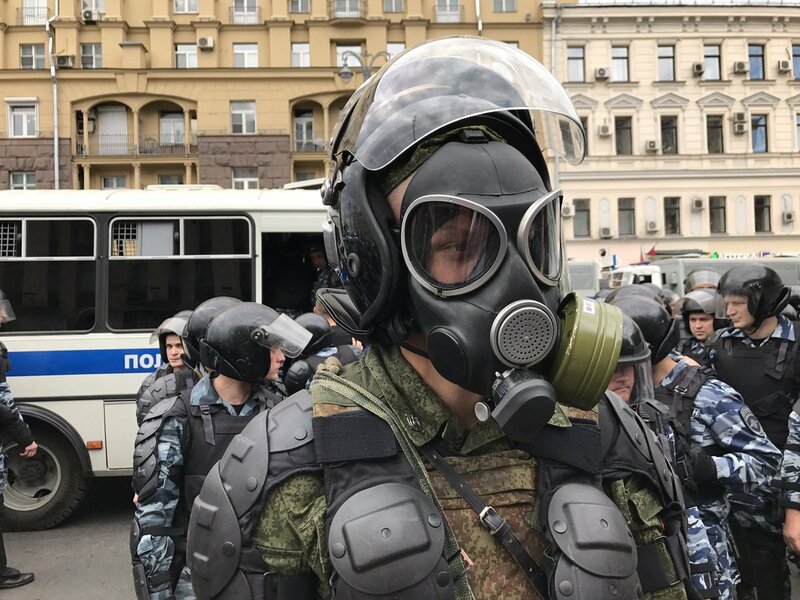 The protesters shouted “Putin is a thief,” “Putin out” and “Russia without thieves.” Pictures on social media showed police putting gas masks on. Navalny’s press secretary, Kira Yarmysh, posted on Twitter that tear gas was used against her. There was also a large police presence in St. Petersburg, where protesters chanted “shame” during a rally at the Field of Mars park. More than 200 towns and cities signed up for protest rallies to mark the Russia Day public holiday, according to Navalny’s social media accounts. The opposition leader said earlier they would proceed regardless of whether the government allowed them. 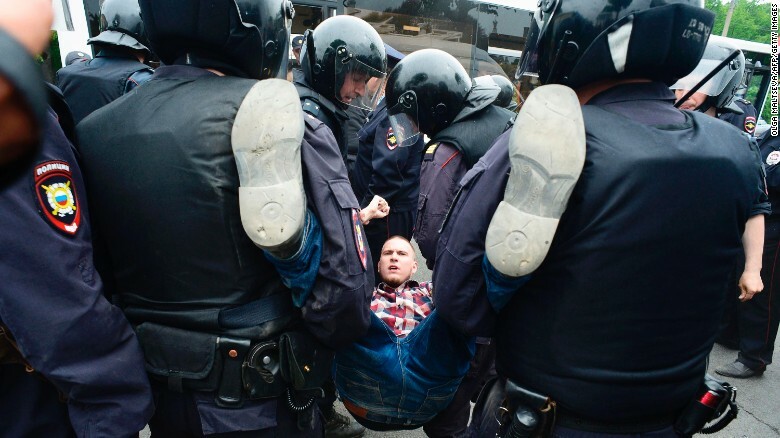 Police arrest a protester in St Petersburg. In March, thousands joined protests in almost 100 cities across Russia, angered by a report that Navalny published accusing Prime Minister Dmitry Medvedev of corruption. Medvedev has denied the claims. 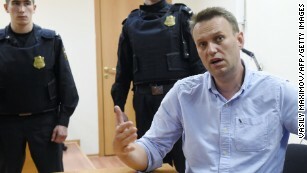 Navalny was arrested, along with hundreds of others, and jailed for 15 days after being convicted of disobeying a police officer. CNN’s Tim Lister and journalist Mary Ilyushina reported from Moscow. CNN’s Diana Magnay reported from St. Petersburg, Russia, and CNN’s Elizabeth Roberts reported and wrote from London. CNN’s Donie O’Sullivan in New York also contributed to this report.